NEW YORK (CNS) — The year just past saw the release of a number of films whose celebrated cinematic quality was not matched by moral merit. Writer-director Richard Linklater’s “Boyhood,” for instance, though remarkable for being filmed over the course of more than a decade, took an indifferent stand toward the unacceptable experimentation of its youthful main character. Similarly, while Damien Chazelle’s jazz-themed drama “Whiplash” boasted an outstanding performance from J.K. Simmons in the role of an obsessive music teacher, distorted values permeated the often-abusive proceedings. As listed below in alphabetical order, by contrast, the Media Review Office of Catholic News Service’s top 10 movies — and top 10 family films — for 2014 reflect not only the aesthetic worth of the titles chosen but their ethical acumen as well. Except as indicated, the Catholic News Service classification for the films on the first list is A-III — adults, and their Motion Picture Association of America rating is PG-13 — parents strongly cautioned. Some material may be inappropriate for children under 13. For movies under the second heading, unless otherwise noted, their CNS classification is A-I — general patronage, while their MPAA rating is PG — parental guidance suggested, some material may not be suitable for children. – “American Sniper” is a sober war drama based on expert sharpshooter Chris Kyle’s (Bradley Cooper) 2012 memoir about his service as a Navy SEAL during the conflict in Iraq. Director Clint Eastwood successfully conveys the heroic personal commitment that motivated Kyle to protect his fellow fighters (R — restricted. Under 17 requires accompanying parent or adult guardian). — “Cesar Chavez” is an understated but valuable portrait of the famed labor leader and pacifist (Michael Pena) who co-founded the United Farm Workers of America. Chavez’s Catholic faith is always in the background and sometimes front and center as director Diego Luna’s meditative take on his story unfolds. — A mouthwatering comedy-drama about one man’s obsession with food and family, “Chef” was written and directed by Jon Favreau, who also plays the title role. He serves up an old-fashioned, heartwarming labor of love that’s all the more refreshing since it shows family values triumphing over obstacles (R). –The crackerjack sci-fi adventure “Guardians of the Galaxy” sees a human freebooter (Chris Pratt) vying with trio of aliens for possession of a mysteriously powerful orb. Director and co-writer James Gunn’s rollicking adaptation of a series of Marvel comics showcases self-sacrificing love as well as dedicated camaraderie. — The sequel “The Hunger Games: Mockingjay, Part 1” offers satisfying, occasionally stirring, action as the franchise’s heroine (Jennifer Lawrence), a veteran of the brutal survival tournament of the title, becomes the symbol of the revolution against its organizers. Director Francis Lawrence highlights positive values, including altruism (A-II — adults and adolescents). — “Ida” is a starkly beautiful minimalist masterpiece, set in 1962 Poland, about a novice nun (Agata Trzebuchowska) who learns that she was born Jewish and that her parents died in the Holocaust. Director and co-writer Pawel Pawlikowski’s drama subtly examines a range of religious and historical contradictions. — Adapted from John le Carre’s 2008 novel, the tense cat-and-mouse espionage thriller “A Most Wanted Man” features Philip Seymour Hoffman in his final leading role. Director Anton Corbijn’s film portrays the extreme measures spies take to combat terrorism, and the moral compromises that go with them (R). — A crucial battle in the long struggle for African-American equality is compellingly recreated in director Ava DuVernay fact-based drama “Selma.” David Oyelowo plays the Rev. Martin Luther King Jr. as the famed civil rights leader works to secure long-overdue access to the ballot for minority voters in the South. — Directed by Alastair Fothergill and Keith Scholey, the wildlife documentary “Bears,” which follows the lives of an Alaskan brown bear and her two cubs, is a marvel of moments great and small captured in stunning cinematography (G — general audiences). — In the action-packed animated adventure “Big Hero 6,” a teenage inventor (voice of Ryan Potter) uncovers an evil conspiracy, then assembles an unlikely team of aspiring superheroes to fight it. Directors Don Hall and Chris Williams’ loose adaptation of a series of Marvel comics offers good lessons in friendship, self-sacrifice, and resisting temptation (A-II). — With “The Boxtrolls,” Alan Snow’s 2005 children’s novel “Here Be Monsters!” becomes a charmingly bizarre screen fable about rich and poor, featuring first-rate voice work by Jared Harris, Ben Kingsley and Elle Fanning. Directors Graham Annable and Anthony Stacchi use stunning animation to celebrate family, loyalty and cooperation (A-II). — The big guy with the red, white, and blue shield (Chris Evans) returns to save the planet in the rousing sequel “Captain America: The Winter Soldier.” Directors (and brothers) Anthony and Joe Russo’s extension of the Marvel Comics franchise is sure to please fans of the superhero with its patriotic, gung-ho tone and grandiose action sequences (A-II, PG-13). — “Dolphin Tale 2” continues the real-life story of Winter, the female dolphin with the prosthetic tail. As her original rescuers (Nathan Gamble and Cozi Zuehlsdorff) help her face a new crisis, returning director Charles Martin Smith delivers a wholesome movie that carries valuable messages about responsibility and perseverance. — Director and co-writer Peter Jackson’s trilogy of films based on Catholic novelist J.R.R. Tolkien’s 1937 fantasy for children reaches a rousing finale in “The Hobbit: The Battle of the Five Armies.” The warping effects of avarice are poised against the redeeming consequences of heroic selflessness as the title character (Martin Freeman) concludes his many adventures (A-II, PG-13). — In the animated sequel “How to Train Your Dragon 2” — adapted, like its predecessor, from Cressida Cowell’s series children’s books — writer-director Dean DeBlois oversees the creation of outstanding visuals as he charts the ongoing efforts of an enlightened Viking (voice of Jay Baruchel) to protect dragons from human prejudice. — “The Lego Movie” centers on an ordinary construction worker (voice of Chris Pratt) who finds himself taken for a prophesied hero. 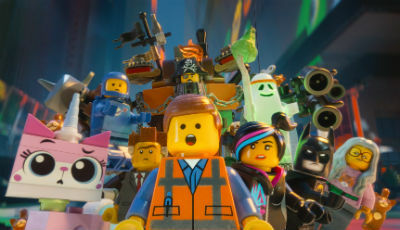 Colorful, fast-paced and diverting, directors and co-writers Phil Lord and Christopher Miller’s animated adventure is also surprisingly pointed in its satire of conformist consumerism. — “Muppets Most Wanted,” another sprightly musical outing for the beloved puppet ensemble created by Jim Henson, hinges on the most unlikely of plot twists: Kermit the Frog’s (voice of Steve Whitmire) confinement in a Siberian gulag. Director and co-writer James Bobin’s follow-up to his 2011 franchise re-launch combines singing, dancing, innocent humor and entertaining cameos. — Comic possibilities drive the freewheeling plot of directors Eric Darnell and Simon J. Smith’s lark, “Penguins of Madagascar.” As it trots around the globe following a quartet of the title creatures, this animated espionage-themed adventure instills lessons about the positive results of loyalty, teamwork and cooperation.